A recent study put out by American researchers is helping scientists better understand how the retina produces and consumes energy. 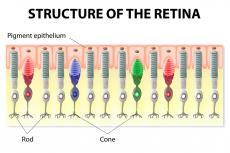 This new data shows that the waste products of rods and cones play a critical role in maintaining healthy retinal function. Eye doctors have already known that retinal rods and cones have to move incredibly fast to help us sense light. They've also known that the retinal pigment epithelium (RPE), which is just below the retina, brings in a ton of glucose to the retina. One common question scientists have had about this process is why the RPE just gives its glucose away. Thankfully, Dr. James Hurley of the University of Washington has discovered the answer to this riddle. Through a series of tests, Dr. Hurley and his colleagues showed that the RPE relies on the lactate that's produced by the retina's rods and cones. The rods and cones only produce lactate by consuming and burning off tons of glucose. To figure this out, Dr. Hurley took a sample of human retinal cells and grew RPEs in a laboratory. He also examined the retinas of lab mice. After weeks of study, Dr. Hurley's team found that the mitochondria in the RPE primarily used the lactate byproduct of retinal rods and cones to fuel its operations. Hurley also showed how numerous retinal diseases could be caused by improper conversion of glucose to lactate. He found that when the RPE couldn't get enough lactate, it started to burn off its own glucose for energy. Of course, once there's no glucose left, the retinal cells start to disintegrate. Deborah Ferrington, a vision expert at the University of Minnesota, says Dr. Hurley's findings support her own research into macular degeneration. Over the past few years, Dr. Ferrington has pointed out the link between a defective mitochondria and retinal diseases like age-related macular degeneration (AMD). Gene therapy experts like Columbia University's Stephen Tsang are extremely interested in these new findings. Tsang believes gene therapy might be the key to correcting genetic glucose starving defects in the retina. In addition to explaining various diseases, this research has also cleared up an issue in the ophthalmology field. Dr. Zsolt Ablonczy, who works at the Medical University of South Carolina, says Dr. Hurley's research explains why cones die when rods are defective. With this new study in mind, Dr. Ablonczy hypothesizes that the rods are more responsible for producing lactase than the cones. If the rods can't produce lactase for whatever reason, then they won't be able to feed the RPE and basically starve out the cones. While this research is exciting, it's still only in the beginning stages. Eye doctors will need to run further tests on healthy human subjects as well as patients with retinal diseases to better understand how this relationship works. People in interested in learning more about Dr. Hurley's work can follow him on this website.